SRA Home Products’ pergolas offer an ideal solution — combining both function and style — for decorating your Newark, Delaware, backyard. A pergola provides you with shade and protection from the elements, and will no doubt also become a breathtaking conversation piece for your guests. Attached — Our attached pergolas directly connect to the side of your home. 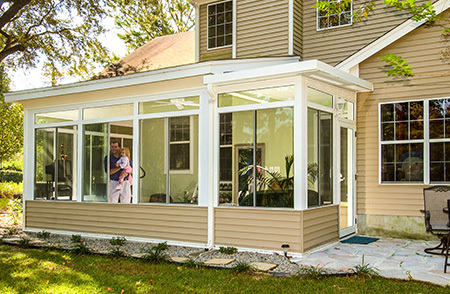 Having one of these installed maximizes your relaxation space, as the side connected to your home doesn’t require any supporting columns. Freestanding — Our freestanding option allows you the freedom to install your new pergola almost anywhere on your property, as it doesn’t have to be tethered to an existing structure. 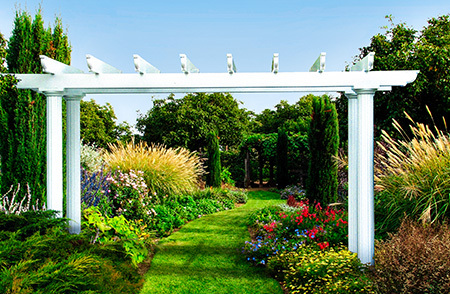 Garden Arbor — Our garden arbors are similar to our freestanding pergolas, in that they don’t need to connect to a wall, but they feature an open-beam design to encourage climbing vines. Operable — We also offer an operable pergola option, which allows you to effortlessly switch between open rafters and a closed cover using a slow-motion motor. All of these options are constructed using heavy-duty fully extruded aluminum, which resists insect infestation and is stronger than roll-formed aluminum, vinyl, and wood alternatives. 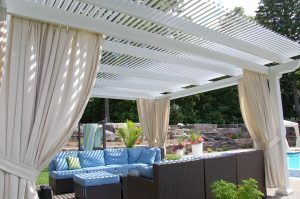 TEMO pergolas also include an innovative coating that resists cracking, peeling, and warping. Our pergolas feature curved lattice paneling, which is superior to comparable options because it provides additional shade. They also feature columns available in three different styles — Venetian, Roma, and Florentine — which are all inspired by the Mediterranean region. If you’re interested in having one of TEMO’s stylish pergolas installed at your Newark, DE, area home, please contact SRA Home Products today. We’ve been family-owned-and-operated for two generations, and our commitment to quality and our customers has allowed us to achieve an A+ rating from the Better Business Bureau.